Arthur A. Levine Books, 9780439724173, 32pp. For young cowboys and little scientists, an ARE YOU MY MOTHER? for the 21st century! But there's a problem; Roy doesn't know what a horse IS! So he sets off to find out with hilarious results: A snake tells him to look for a creature with legs. A crab has six legs, but he's too unfriendly to be a horse. 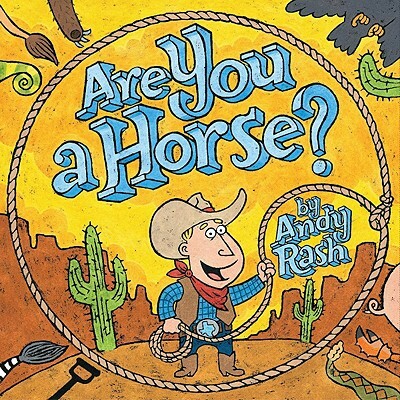 A chameleon smiles at Roy, but horses don't change color... What's a horseless cowboy to do? Andy Rash was born on a mountain top in Tennessee and raised in the small polymer town of Kingsport, where all green plastic soda bottles come from. He earned a Bachelor of Fine Arts from the Savannah College of Art and Design during a rather rocky period in that school's history, and a Masters of Fine Art at the School of Visual Arts in New York while things seemed to be going relatively smoothly. Since graduating, Andy has been a freelance illustrator, working for many national magazines and newspapers. He has also taught illustration at the School of Visual Arts. In addition, Andy finds himself at the beginning of a remarkable career in children's books. His first picture book, The Robots Are Coming, an American Bookseller Pick of the Lists, was published by Arthur A. Levine Books / Scholastic. He also illustrated Daniel Pinkwater's Fat Camp Commandos and Fat Camp Commandos Go West, and his second picture book, Agent A to Agent Z for Arthur A. Levine Books / Scholastic.